Listening to Chelsea Wolfe’s music is a religious experience. Seeing her live is a revelation. Last night, the LA queen of bleak, doom-laden folk heaviness took the stage at Berghain’s Kantine and proceeded to make the crowd move faster than those Actual Pain leggings (holla, haha). Hovering before the microphone, Wolfe began the first plaintive notes of ‘Movie Screen’, and as her looped voice swept all other sound from the room, so too was my mind swept away. There was such power, such beauty being unleashed, that to speak or think of anything else seemed like sacrilege (and not the cool fun kind either). When the raw, jagged edges of ‘Demons’ followed, a sea of black-clad bodies surged to-and-fro in time, connected and commanded by Wolfe’s fallen-angel voice. In what felt like an achingly short amount of time, Wolfe and her band had moved through a set that included the shimmering, shimmying ‘Mer’ and the glorious, sprawling epic closer from her LP Apokalypsis ‘Pale On Pale’ before slinking offstage. Only to return a moment later, as the crowd supplicated to her for more. The snotty little anarcho kid in me shrieked in pleasure when she began her cover of Rudimentary Peni’s ‘Echo’. Injected with new energy, I began my ritualistic, spastic head/body sway. This was the real magick, the feeling of true musical connection between artist and audience, honest and beautifully dark. Then, a brief blur. The show ending. A brief conversation, a moment where Wolfe recognized me and gave me a hug, some response on my part that was probably nonsense, and the promise of a return at a future date. Do I overgush? I’m never usually one to play the fanboy. 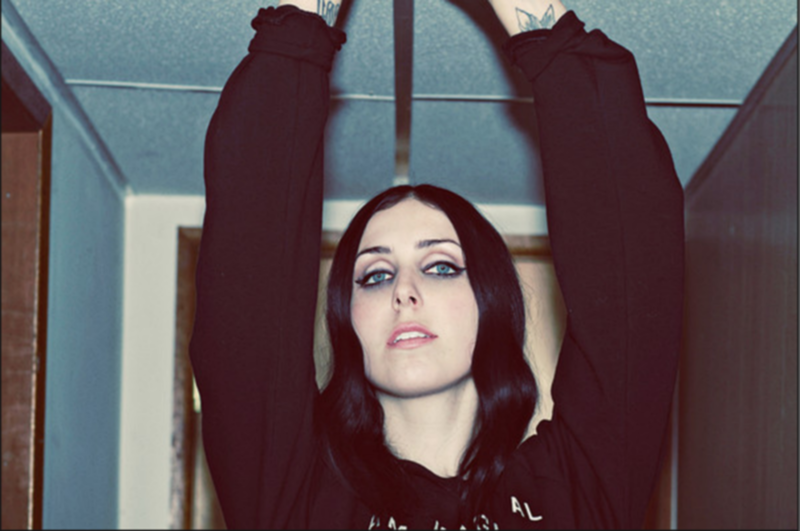 But speaking as a musician myself as well as a promoter and attendee of numerous shows large and small, the feeling that Chelsea Wolfe’s music gives is one that is rather rare. “I was worried that there wouldn’t be many people here.” Wolfe said to me after the show, but her music had taken me to a place where I felt like she and I were the only ones there anyway. I left with the largest smile on my face in a long time.